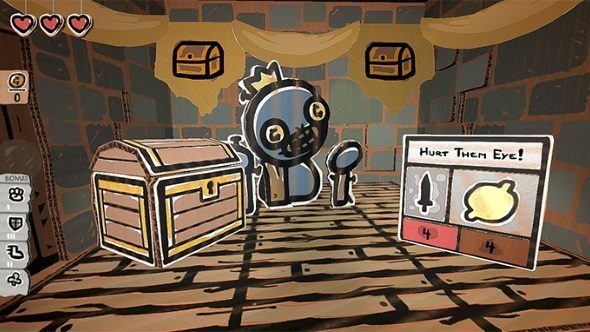 Sadly, those of us still waiting on Edmund Mcmillen’s bizarre puzzle-quest-meets-Isaac dungeon crawler The Legend of Bum-bo will have to wait just a little longer. As mentioned on Twitter, the design of the game has expanded again beyond original plans, meaning that it’s now due sometime during the first half of this year, although that means it’s up to six months away, with a status update & trailer due February. It’s not all bad news, though. Bum-bo developer Edmund Mcmillen pointed out Revelations, a particularly great (and seasonally chilly) looking Binding Of Isaac: AB+ mod for us to try. You can’t talk about indie gems on the PC without talking about Mcmillen and his friends and the copious titles they’ve churned out over the years, but here’s a few of the best of the rest. Not long after delivering the bad news, Edmund did at least share something nice: The Revelations mod for Binding of Isaac promises a big chunk of chilly-themed new content, with a new environment type to explore (the Glacier), along with 8 new bosses to fight, a slew of new regular enemies, 20+ items to play around with, a new playable character (Sarah) and some extra surprises to discover along the way. This is the first of three planned chapters of the Revelations mod. The plan is for the full mod to effectively offer an all-new alternate route through the game with unique enemies, bosses and environments the whole way through to the end credits, but for now it’s just a detour into this new frostbitten environment. While some creators have had less-than-flattering things to say about the Isaac modding SDK, it’s great to see a regular stream of new content being created by the community. You can grab the Revelations: Chapter 1 mod here, and we’ll keep you posted on when both the second chapter pops up, along with any news on The Legend of Bum-bo, along with any other news relating to Edmund Mcmillen’s many parallel development projects.